Ibrahim Osi-Efa is upon the theology of Ahl al-Kalaam, those who adopted the conceptual tools and baggage of the Hellenized Jews, Christians and Sabeans and used them to distort the Book of Allaah and deny (aspects of) the Prophetic Sunnah. This faction appeared in the early first century hijrah when al-Ja'd bin Dirham and al-Jahm bin Safwan brought in the use of Aristotelian and neo-Platonic language to speak about theology. The Mu'tazilah took it from them, and then a series of sects appeared who took this same path, including the Raafidee Hishaamiyyah, the Kullaabiyyah, the Karraamiyyah, the Ash'ariyyah, the Maturidiyyah, the Saalimiyyah and others. Amongst them were Mujassimah and amongst them were Mu'attilah and both (errant) ways are founded upon the same ilm al-Kalaam which is a term that represents the philosophical baggage of the Hellenized nations (Jews, Christians, Sabeans) who incorporated the metaphysical language and terminology of Aristotle in theological discussion and debate. Before reading this series of articles you must do some background research to be able to follow along. The recommended articles for study are this article (provides good historical background and context), this series (Aristotle, Philo Judaeus, Augustine, the Sabeans, the Mu'tazilites and the Ash'arites), this series (Destroying the Allegation of tajsim and Tashbih Against Ahl al-Sunnah) and Part 4 and Part 5 of a series dealing with the creation or eternity of the universe between the Mutakallimeen (Ahl al-Kalaam, Jahmiyyah and their offshoots) and the Mutafalsifah (al-Farabi, Ibn Sina). The reader is also encouraged to study articles on this site through which it will become clear that todays Ash'aris do not follow Abu al-Hasan al-Ash'ari (rahimahullaah), but those later ones (Ibn Fawrak, Abu Mansur al-Baghdadi, al-Qushayree, al-Juwaynee, al-Ghazali, al-Raazee, al-Aamidee, al-Taftazani) who came after him and, through their own input and influence, took the early Kullaabi-Ash'ari creed in the direction of the Mu'tazilah, the Jahmiyyah, the Soofiyyah, Gnostic illuminists, eventually merging Kalaam with Falsafah as was done by the later ones. The evidence for that is overwhelming and can be found in articles on this site. What is known as "Ash'ariyyah" today is not what Abu al-Hasan al-Ash'ari died upon. Many of the smart and shrewd ones amongst todays Jahmites (posing as Ash'aris) know this very well and hence, they describe "Ash'ariyyah" as a "dynamic approach in theology" and not necessarily a fixed set of doctrines (because of the presence of much conflict, contradiction and inconsistency that is inherent in the Ash'ari school). This is just one example of the many frauds they perpetrate against innocent Muslims who simply want to know the creed brougth by Muhammad (sallallaahu alayhi wasallam) and believed by the Companions (radiallaahu anhum), which is in accord with the fitrah and which is devoid of the conceptual baggage of that heretical Kalaam (a cover label for "philosophy") which they entered into the Ummah, split the Muslims and brought trials and calamities upon them. Shaykh Ibrahim was born and raised in Liverpool, England. He was blessed with the opportunity to study several classical disciplines at the hands of some of the holders of the tradition such as Murabit al-Haj, al-Habib Umar b. Hafiz and Shaikh Hassan al-Hindi. Initially studying for three years in Syria and Mauritania, Ustaz Ibrahim was then blessed with the opportunity to spend over six years in the illuminated city of Tarim, Hadramaut where he studied under the qualified hands of teachers such as al-Habib Kazim al-Saqqaf, al-Habib Ali al-Jifri and al-Shaikh Umar Husain al-Khatib. Shaykh Ibrahim Osi-Efa was one of the founders of several Islamic initiatives including the Ibn Abbas Institute, Starlatch Press, Badr Language Institute and the Greensville Trust. Shaykh Ibrahim Osi-Efa currently resides in Liverpool, England with his wife and two children. It is clear that the teachers of this man are Jahmites, gnostic-illuminists, mystics and those calling to saint-worship - matters which al-Ash'ari was free and innocent of. In this series of articles we are going to deconstruct the deen of the Jahmites which is taught through his course entitled Micro Madrasa. Our aim in these articles is to allow the reader to see the clear difference between what the Righteous Salaf were upon and between what the Ash'aris and Maturidis inherited from al-Jahm bin Safwan, the Jahmiyyah and the Mu'tazilah. In the course of these articles many of the historical and academic frauds of those posing as "Ash'aris" today and the Maturidis will become clear by Allaah's permission. Throughout this series we will refer to Ibrahim Osi-Efa and his theological family as the Jahmiyyah, since al-Jahm bin Safwan (and al-Ja'd bin Dirham) are the primary origin points for their theology, and the term "Jahmiyyah" is really an umbrella term for all those factions who built their theology upon the conceptual baggage and terminology brought into the Ummah by the Jahmiyyah in the first century hijrah. 01. Just as a person will not achieve the desired goal by worshipping Allaah through other than what He legislated and just like a person will not achieve the worldly pursuits through other than the ways and means that lead to their acquisition, then likewise the theology of Ahl al-Kalaam does not lead to the desired end, which is rationally proving Allaah's existence, the Prophethood of Muhammad (sallallaahu alayhi wasallam) and the Resurrection. 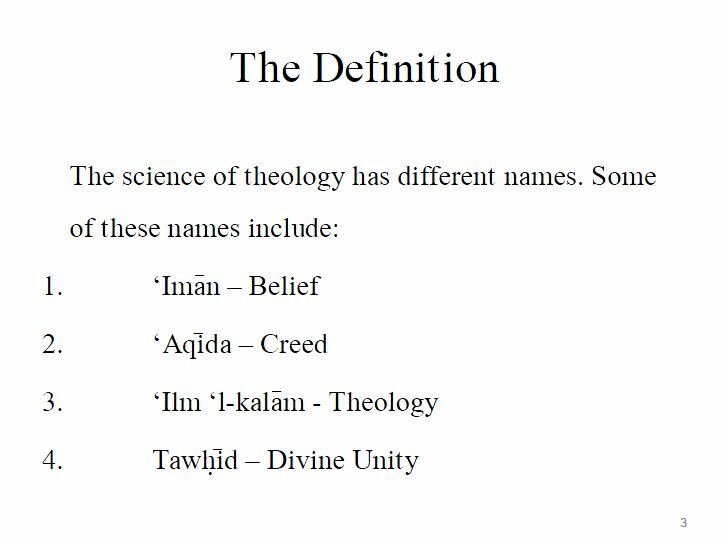 The theology of Ahl al-Kalaam aims to establish these three affairs. However, the tools and goods being offered are flawed and defective and do not lead to the desired outcome, despite appearing to do so on the surface. This is why many of those who delved into it (al-Ghazali, al-Razi) for a lifetime only ended up utterly confused and bewildered at the end of their lives, and went through many different (often contradictory) phases or viewpoints. These tools and goods are the refuse of previous nations, the Hellenized Jews, Christians and Sabeans, and the theology of Ahl al-Kalaam from the Muslim nation is simply plagiarized from their theology (in terms of the underlying language). A quick survey of the language used by the Sabeans, Philo Judeas of Alexandria and Augustine of Hippo (read this series) will soon take you out of the cloud cuckoo land of today's Jahmites posing as Ash'aris and put you squarely into reality. In this first slide Ibrahim Osi-Efa aims to define this "theology" with a view to legitimizing it. And alongside this, then the saying of Allaah, the Most High, "So set your face towards the upright religion, Allaah's fitrah (meaning Tawheed) to which He has made mankind to be inclined..." (ar-Rum 30:30) and the hadeeth, "Each child is born upon the fitrah (i.e. inclination to Allah's recognition and Tawheed)..." are very clear in rebutting this matter from its very foundation. And the Prophet (sallallaahu alayhi wasallam) did not call anyone to contemplation (over the creation for deduction of proof for Allah's existence) and nor to the mere affirmation of a creator. Rather, the first thing he called them to was the two testimonials (of faith) and this is what he commanded the Companions. 03. To understand and put Scholars like al-Nawawi, al-Qurtubi and Ibn Hajr into perspective and grasp how they are deceptively used and placed into the first layer of the cake of deception of the Jahmiyyah in order to call people to their theology based upon the heretical (philosophical) Kalaam they made to be the foundation of Islaam, read the following articles: "The Levels and Ranks of Ash'arism or Those To Whom It is Ascribed" (read here), and the relevant paragraph in "Destroying the Slander of tajsim (Anthropomorphism) Against Ahl al-Sunnah wal-Jamaa'ah: Part 1" (read here). 04. Upon the false premise that the first obligation is al-nadhr wal-istidlaal (investigative study into proof of the universe being originated), the Theologians (of the ilm al-Kalaam condemned by the Salaf) elaborated upon a proof known as "huduth al-ajsaam" that has flawed, corrupt principles underlying it. These flawed corrupt principles allowed the Philosophers who believed in the eternity of matter to assault the theology of the Mutakallimeen (Ash'aris, Maturidis) when they saw the weakness in them, and this led to centuries of battle and debate and also saw utter confusion and bewilderment amongst the greatest of their scholars, such as al-Ghazali (d. 505H) and al-Razi (d. 606H). When Ibrahim Osi-Efa is defining "theology" for you here in this first slide, this is what he is drawing you into. A worn-out, outdated, flawed kalam theology that does not attain the objective. Rather, it was and continues to be pounded by the atheists and Philosophers today and it only causes those who delve into it to inherit doubt. Be sure that eventually, it leads only to one of two things: a) the admission that the Kalaam argument proves the opposite, that the universe is eternal and there was no actual act of creation that took place which can be ascribed to Allah the Exalted as His act, ascribed to His essence (since the very nature of the proof requires this negation), or b) insist on the validity of this proof and affirm the universe was originated by a cause which you must then define only in terms of the philosophical, metaphysical, conceptual terminology you used to argue for it in the first place, in which case you will be gravitating towards an Aristotelian deity (immaterial, changeless, timeless, unembodied "mind" or "intellect") and then you will start assualting the reveled texts to make them agree with this language, veiling that assault under the deceptive slogans of "ta'weel", "tafweed" and "tanzeeh." There were many varieties of Platonism in Islam. One of the earliest of the Muslim Theologians, Jahm ibn Ṣafwān (d. 746), was promulgating a view of God remarkably different from that of his contemporaries and yet remarkably like the negative theology current in later Greek Neo-Platonism. Islamic Philosophical Theology (ed. Parviz Morewedge, State University of New York Press, 1979), p. 14. Referring here to the negation of being "material" and being subject to time and space and subject to events (hawaadith) and all the associated language and terminology that follows on from this, which was the hallmark of the Jahmites (and the Mu'tazilah, Ash'ariyyah and Maturidiyyah) who founded their theology upon this kalam, all of which actually originates from the definition of the "first cause" identified by Aristotle in his Metaphysics in the following language: "The unmoved mover is infinite, since it causes infinite motion. It follows that it is also without magnitude, since an infinite force cannot reside in a finite magnitude (and there can be no infinite magnitudes); having no magnitude means that the first mover is indivisible, having no parts", (now you know where the Mutakallimin get their statements such as "God does not occupy space, God does not have spatial extension" and so on). This unmoved mover is, "eternal, unmovable and separate from sensible things" (meaning cannot be perceived with the senses, and this is what al-Jahm bin Safwan brought into the Ummah), and he also says, "God is separate from sensible things because God has no magnitude (megethos), God is without a body or a spatial existence. The reason that God can have no magnitude is that God produces motion through infinite time, which means that God must be infinite, since an infinite effect requires an infinite cause; but there cannot be such a thing as an infinitude magnitude. As being a substance without magnitude, God is without parts and, therefore, indivisible (magnitudes are divisible)", and here in the next statement we see the Tawhid of the Jahmiyyah, Mu'tazilah and Ash'ariyyah, where in Metaphysics 12, we read "the primary essence has no matter, which means that there can only be one God, since it is matter that differentiates one form or definition into many manifestations of that one form or definition. Since God has no matter, then God is one not only formally or in definition, but also numerically" and here is something else which is a parallel to the theology of the Mutakallimin, straight from Aristotle, "It has been shown also that this primary essence cannot have any magnitude, but is without parts and indivisible. But it has also been shown that it is impassive and unalterable; for all the other changes are posterior to change of place." This last statement alludes to what the Mutakallimin are upon of denying what they call hawaadith for Allaah, the denial of those matters tied to Allaah's will and choice which they call "events" and "changes" but which to Ahl al-Sunnah are Allaah's chosen actions (Af'aal Ikhtiyaariyyah). 06. Now, once you have grasped the above, the rest of this series will make total sense to you when we deconstruct the theology of Ibrahim Osi-Efa. You will immediately recognize and see what is behind the claims of Ibrahim Osi-Efa with respect to theology and you will see that his creed is founded upon the Metaphysics of Aristotle and the "negative theology" that is fundamental to it (negating Aristotle's Ten Categories from Allaah), and you will see how this Aristotelian Tawhid clashes with the Tawhid of the Messengers, the affirmative theology in the Qur'an and in the Sunnah of Muhammad (sallallaahu alayhi wasallam). You will see the Metaphysics of Aristotle permeating the speech of Ibrahim Osi-Efa when he presents the Ash'ari, Maturidi views on Allaah's uluww, Allaah's ru'yah, Allaah's speech and the Qur'an. You will see the intoxicated mind of Ibrahim Osi-Efa, intoxicated with that Kalaam that leaves him and whoever is poisoned by him in a drunken stupor that is hardly recognized (by the uninformed and unaware) since Intoxication of the mind and intellect through false, corrupt conceptions and ideas is a hundred times more subtle than the Intoxication of the body through liquids, vapours and chemicals - please visit our support group, Aristotelians Anonymous (here) to learn more about this Intoxication. 07. When the Jahmiyyah and their offshoots (from whom Ibrahim Osi-Efa is descended) made this to be the foundation of their religion and they wrongly thought that merely affirming a creator and proving a creator on rational grounds enters one into the ranks of the Muwahhideen, and that this is the desired Tawheed, they had laid down the foundations of great misguidance in the Ummah and they opened the way for the shirk that the Messengers came to warn against and all the doubts associated with it to justify it. This is because their Tawhid does not go beyond the affirmation of creator - a matter which is fitriyy, dhurooriy, as has preceded. As a result, they erred in defining "ilaah" and they erred in defining the meaning of "laa ilaaha illallaah" and claimed it means "al-qaadiru ala al-ikhtiraa'", one who has power to invent, create. But this is not the Tawhid of the Messengers. So their Tawhid became a philosophical Tawhid, spoken of, debated and argued for on the basis of metaphysical language that originates with Aristotle, the languages of bodies (ajsaam, jawaahir) and accidents (a'raad) - and it is on the basis of this language they distorted the Qur'an in the name of ta'weel. We shall take up Ibrahim Osi-Efa's definition of Tawhid in the next article inshaa'Allaah.